I think that's true for suburban and exurban new builds. I'm in a planned urban community and while there are of course larger houses available, relatively speaking, homes here (everything is new/er construction) are smaller than what you'd get for the same money further out. Even with new construction, the people who choose a more urban environment, even including residential neighborhoods within a city, have different preferences and priorities than people choosing suburban or exurban locations. Very true. I have lived in cities large and small almost my entire adult life. I understand that what I think is normal is not what the majority of people think. We were thrilled with a 1200 square foot prewar co op apartment and my friends were busy buying new builds in the suburbs that were three times that much space for far less than we paid. I tend to think of urbanite home owners as the minority on this forum based on the posts I see. But maybe that's just me. I absolutely disagree. I have never lived in a house with a porch that I did not use. Overall, I agree with the OP. Looking back at the places I have lived, my favorites have always had a couple of multipurpose rooms and been on the small side. I can see why someone who has a large family or does a lot of entertaining may want a dining room if their home is not open concept, or a living room (the 21st century version of the Victorian parlor) as opposed to a room that is both living room and family room, but generally speaking, I agree with the idea that many larger homes have a lot of space that is mostly wasted, except to store stuff and impress people. That’s the same faulty logic people use to justify financing houses, luxury items, and cars they can’t afford. What “you have to show for it” is the money in your bank and retirement accounts. Let’s not act like home ownership is a full proof investment with the millions of folks who have lost money on it or who live in depreciating property value neighborhoods. I suppose it depends on how one does it. I'm not paying the $1500/month I did for the rental house I had for two years. I am not paying the $1300/month I had for the two apartments for 3 years or $500 (say average over time) for the one apartment I had for 22 years. The house, the ranch......zero debt. I also never want to live in another urban environment ever again. Can't say that enough. When I retire, I want to live even farther. If I want urban, I'll just drive to it when the need arises. As I said ad nauseum, give me my space and my land. People have different needs and wants. You do you, I say. I agree - people should live in the kind of home they want (and hopefully can afford) in the location they want to me. However, I still believe there is a benefit to thinking things through about how you are going to live in a house and if it will fit that lifestyle. And of course that goes both ways - I think the people trying to squeeze in to a 300 sq foot tiny house are doing just as poor a job of truly envisioning their life in that environment. I can stay that when I walked into the model home version of my current house, I *immediately* felt at home. I could envision my son and me living there, and things have turned out pretty much exactly the way I imagined on that very first day - except that we use the loft less than I envisioned. I thought that we'd end up going upstairs in the evenings after dinner and hanging out there. But it turns out our living room is so inviting and it also makes it easier for me to try to get everything dealt with for the next day when I'm downstairs - getting the kitchen cleaned up, lunches packed, checking on homework, getting some computer and/or tv time. I could compress all of that into less time and go upstairs, but it's been nice to do it in a more leisurely way. I don't know that I would have realized that ahead of time, and if I had done a diagram, I would have a lot of red dots in the loft, thinking it would be used on pretty much a daily basis, rather than a couple of times a week and sometimes not even that. As I mentioned, my decision to include that space wouldn't have changed, because I think that extra ~250 sq ft will make a big difference when it comes to resale, and the different in price was tiny, I think about 7000. Obviously even if there was room to add on (there's not, we have TINY lots), you could never do it for that kind of price. But doing the kind of thought exercise suggested by this concept could help others do a better job of right sizing their own space when they really think through their day and where in their house they spend their time. The traditional American Dream is NOT necessarily to buy a BIG house. It's just to buy a house, to be a homeowner, a property owner. (Remember, in the early days of the Republic, only property owners could vote.) Nobody said anything about "big". 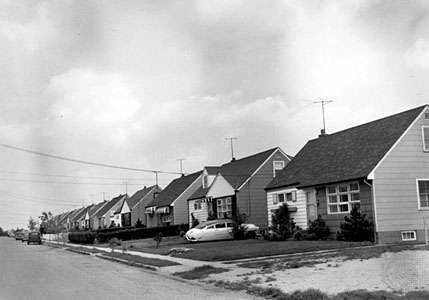 After WWII, remember, some of the suburban houses people bought in droves were very small by today's standards, in tacky-tacky developments on Long Island (Levittown), and the like. People were just happy to have a place to call home, that they were building equity in, and that had a yard for the kids. . That was the American dream. Yeah, but that was 60+ years ago - 71 years ago for the first houses (I grew up going to the Levittown school district although not in a Levitt house). People's tastes and standards have changed. The average new home size keeps going up, so I think it's a fair statement to say that in general, the home the average American dreams about is larger than what someone imagined in 1947. Don't worry it won't last. Soon he will realize it if he hasn't yet. Sweet personal anecdote that is no way relevant to the facts. We’re not a very smart country to whine about stagnant wages, debt, obesity, income inequality, retirement, savings, rising cost of living then whine that more people need to be owning houses. Last edited by Rocko20; 06-10-2018 at 01:04 AM..